Michael is the inspiration and driving force behind the Exeter Festival of South West Food and Drink. Since it began in 2003, the food festival has evolved into an annual major food exhibition of national and even international importance. Some 20,000 visitors come each year to Exeter’s Northernhay Gardens to discover the best food and drink from South West England: More than a hundred artisan food and drink producers; the regions best and most colourful chefs; educational taste workshops and demonstrations; fabulous street food and drink; and as the sun goes down, the “beats” music festival comes alive at the castle. 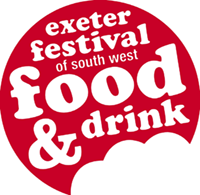 The South West Festival of Food and Drink celebrates the bounty of the region and demonstrates to the world the exciting quality and variety of food and drink from South West England. Over the years the festival has proven itself to be a great success and an event that is popular and sustainable. The many thousands who have visited over the years are proof that people in Exeter and the west country really do care about real food, food made with passion, food that is not mass produced, food that is better and more tasty and more enjoyable to eat. The annual Seven Chefs event marks the launch of the Exeter food and drink festival. The exclusive black tie gala dinner, sees seven of the South Wests best chefs come together to create a collaborative gourmet menu show casing both local, produce, talent and passion. Each course is carefully paired by the regions top wine suppliers, selecting the best wines to enhance the dining experience. Michael himself is the host and compére for the night, presenting to the room; each Chef to announce their dish followed by each wine pairing. The line up of Chef’s is much anticipated, and each year a sell out event! Find out more and keep in touch for news on next years tickets!